If you like walking along rivers you should not miss the Zouave statue at the Pont de l’Alma. Zouaves were a sort of light infantry fighting for the French army at the end of the 19 century and the beginning of the 20th century. They were originally from the French North Africa domains and reputable warriors. When the Alma bridge on the river Seine was built, several statues were set on the bridge piers. The Alma bridge gets its name from a battle won in Crimea between French, British and Ottoman forces against the Russians. Four statues would represent the four types of military regiments that the French army had at that battle. After several renovations, only the Zouave remains. The reason why it is famous is that this statue has become the reference point to measure how high the waters run in the river. 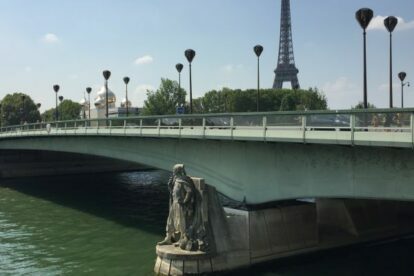 In 1910, the water reached shoulder level, and now, every time there are heavy rains in the Seine river basin, Paris citizens drop by the Alma bridge to check how high the water is running compared to the statue. When the water reaches the feet of the statue, the river banks are closed, and neighbouring museums and buildings start to prepare for water leakages. It is a very nice thing to see and an excellent spot for a selfie.